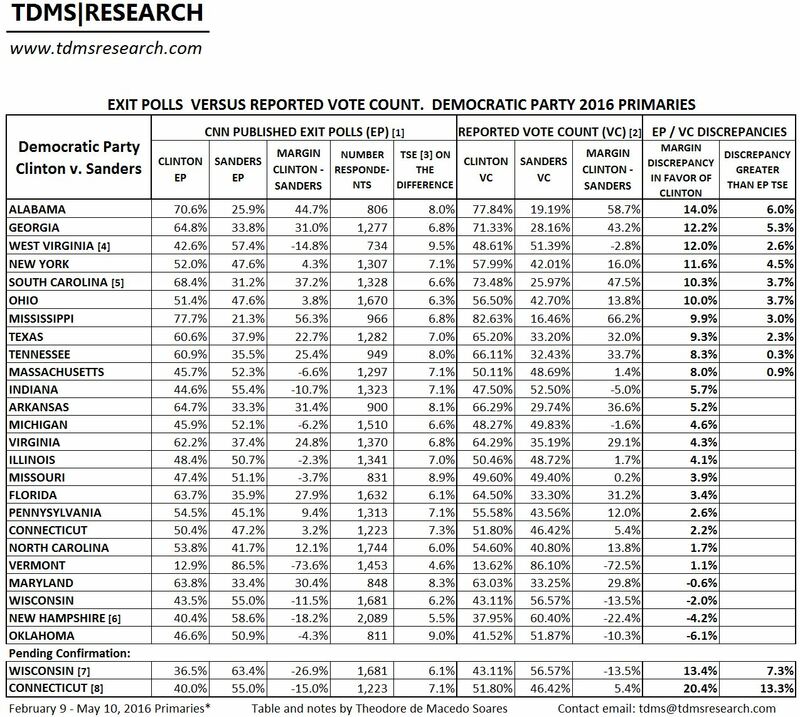 This is an excellent analysis of the Democratic primaries from Axel Geijsel of Tilburg University -(The Netherlands) and Rodolfo Cortes Barragan of Stanford University (U.S.A.) . The authors compare exit poll and recorded results in two groups of states : 10 with paper trails and 14 without paper. They reference my exit poll spreadsheet and CVS graphs as well as the NY Times for the recorded vote data. I added the following calculations to the Democratic Primaries spreadsheet referencing the Geijsel/Barrigan spreadsheet. Sanders did nearly 15% better in the 14 states with a paper trail than the non-paper ballot states. He won the unadjusted exit polls in the 14 states by 5.2%, but lost the reported vote by 2.7%. Steven D of caucus99percent.com: posted this note: This is a very long post, and contains the response of the authors of the study,“Are we witnessing a dishonest election? A between state comparison based on the used voting procedures of the 2016 Democratic Party Primary for the Presidency of the United States of America,” to critics who posted highly negative and derogatory comments to my initial blog post on this matter at Booman Tribune. Unless you are a stat geek, feel free to stop reading when you reach the section marked Attachment. In regards to your earlier email. The criticism that you forwarded to us can be divided in two parts. The first is that we should add additional data in our appendix (most of which we have available), the second is that we shouldn’t have used the exit poll data. The former we have no qualms with and will be more than happy to include, the latter is based on faulty information, and considering the vigor with which they mention it. We could not help but feel it was drivel. Especially given the fact that they linked to a website which was authored by someone who doesn’t know absolute basics of statistics. Some of the sources coming from media-outlets, from which most of the writers in question knowing very little about statistics (certain articles kind of shocked me). An interesting one of the mentioned sources being from Nate Silver (fivethirtyeight), where he wrote a 10-part critique about exit polling: For which he did not go unscrutinized: . He has received earlier criticism as well from different analysts. [; . And from anecdotal reference, he has been criticized many times more before too. In short, exit polling works using a margin of error, you will always expect it to be somewhat off the final result. This is often mentioned as being the margin of error, often put at 95%, it indicates that there’s a 95% chance that the final result will lie within this margin. In exit polling this is often calculated as lying around 3%. The bigger the difference, the smaller the chance that the result is legitimate. This is because although those exit polls are not 100% accurate, they’re accurate enough to use them as a reference point. In contrast to the idea that probably 1 out of 20 results will differ. Our results showed that (relatively) a huge amount of states differed. This would lead to two possibilities, a) the Sanders supporters are FAR more willing to take the exit polls, or b) there is election fraud at play. Considering the context of these particular elections, we believe it’s the latter. Though that’s our personal opinion, and others may differ in that, we believe we can successfully argue for that in a private setting considering the weight of our own study, the beliefs of other statisticians who have both looked at our own study (and who have conducted corroborating studies), and the fact that the internet is littered with hard evidence of both voter suppression and election fraud having taken place. I hope to have provided you with enough ammunition to feel somewhat at ease.